Toronto city council has formally asked Mayor Rob Ford to take a leave, to apologize for misleading citizens and to co-operate with police. After a debate full of drama and verbal sparring that on two occasions came close to physical confrontation councillors voted 37-5 for the mayor to take a leave. Councillors also gave strong support to other parts of the motion including asking the mayor to apologize and to talk to police. "I am proud of my council colleagues. When the world was watching we did the right thing," said Councillor Denzil Minnan-Wong following the vote. While council cannot compel the mayor to take a leave following the vote two members of his executive – councillors Peter Milczyn and Gary Crawford – said Mr. Ford has lost control of that committee. "He may chair it but we still make the decisions," Mr. Crawford said. The heated debate is the result of a motion from former Ford ally Councillor Denzil Minnan-Wong. The motion asks the mayor to co-operate with police, to apologize and to take a leave of absence. Mr. Ford has refused to step aside or speak with police, but has apologized for his actions. Here are some highlights from the day's events. Twice during the debate, Mr. Ford appeared to physically confront Mr. Minnan-Wong. Both times, the speaker stopped debate. In the second instance, the mayor left his desk and took several quick strides towards Mr. Minnan-Wong. His brother, Councillor Doug Ford, grabbed his arm to stop him and Councillor Maria Augimeri stood to block his way. “Thuggery is unacceptable on the floor of council and the mayor is spiralling out of control,” Mr. Minnan-Wong said during a break in the debate. During the grilling Mr. Ford was emphatic that he is not addicted to drugs or alcohol and insisted there is no reason for him to take a leave from his job. Councillor Denzil Minnan-Wong: Mr. Mayor, do you still have zero tolerance for drugs, guns and gangs? Minnan-Wong: Mr. Mayor, can you tell me how that applies to you? Minnan-Wong: Mr. Mayor, have you purchased illegal drugs in the last two years? Doug Ford fires back, calling councillors "lily white"
Mayor Ford's brother Councillor Doug Ford has a chance to speak and turns his attention to other councillors. "Everyone in this chamber is coming across as holier than thou, lily white. None of you have ever done anything wrong – never, ever, ever. The question is have you ever smoked marijuana? Have you ever smoked marijuana? Have you ever smoked marijuana? It’s a question. It’s simple. It’s a yes or a no. Have you smoked marijuana? The answer I guess is yes. The answer is yes I guess. "I would like everyone else to stand up who has tried smoking marijuana. "The whole council will stand up." After the exchange, the Mayor moves from his seat towards Councillor Minnan-Wong. Doug grabs his arm to stop him. After asking the mayor if he believes he has violated the code of conduct -- the mayor said he isn’t sure -- Councillor Michael Thompson began to question Mayor Ford about the photo of him with three young men in front of a house at 15 Windsor Road in Etobicoke. Police reports have indicated the address is a known crack house, but Mayor Ford grew heated and defensive about those reports. Thompson: I’m asking the questions. Thank you. You’ll get your chance later. Ford: I’m answering but you don’t want to hear my answers. Thompson: Actually, you’re not being truthful. Ford: I’m not being truthful? Have you been in that house? Thompson: I have no interest being in that house. I’m not a crack user. Gasps and a smattering of applause erupt from the public gallery after Mr. Thompson’s retort. As the debate raged at City Hall, a judge ordered the release of more police documents from an investigation that targeted Mr. Ford and an accused drug dealer. Among the information expected to be released includes police interviews with Mr. Ford’s former staffers. Later in the day, the documents were released, containing new information about Mr. Ford's recent activities, including concerns over drug and alcohol use. As councillors took a break for lunch, the co-chairman of the city’s Santa Claus parade took to CP24 to publicly call on the mayor to stay on the sidelines of the parade, saying he had initially planned to do that but changed his mind on Monday night and wanted to walk ahead of the procession. 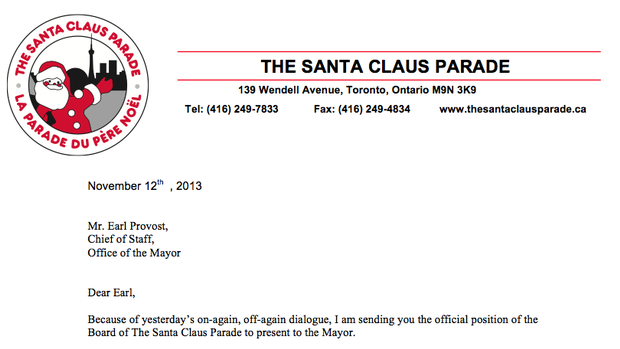 “Our request is simple, we know the Mayor loves the Parade, but for this year let’s avoid this distraction and put the focus back on Santa and Mrs. Claus,” co-chairman Ron Barbaro says in a letter to Mr. Ford’s chief of staff. 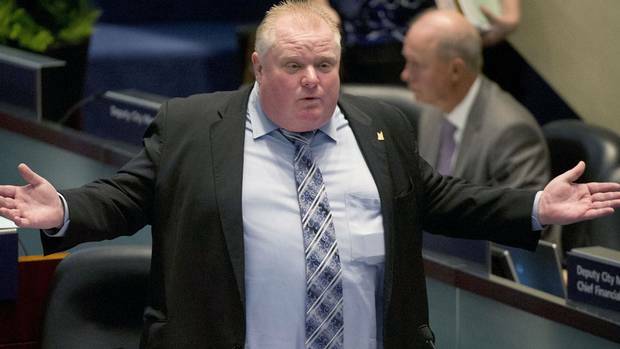 Toronto Mayor Rob Ford stood on his feet for about one hour Wednesday morning answering councillors’ questions about his personal behavior, his use of drugs and alcohol and his alleged ties with accused gang members. "There is nothing else to say guys. I really f’ed up. That’s it. … Again I apologize. I was elected to come down and straighten this mess out. I know I have done a great job running this city, saving taxpayers’ money and putting us on the right path. I am going to continue doing that. I’m not going to miss a meeting. I’ve never missed a meeting. "We are going to move on and get the budget through at 1 ¾ tax increase, lowest in North America. I am so proud of the record I have. I can’t wait for the election. Obviously the campaign started and I’ll be doing everything I’ve done for the last 13 years, returning every call, watching every dime, going to people’s homes and fighting for the little guy of this city. If you want to carry this on, I can’t stop you. I am moving on. You guys can do what you want. "